Last winter Laurence and I stayed in Helsinki for several days and took a day trip to Porvoo Finland. Settled in the Middle Ages, Porvoo is the second oldest town in Finland and is well-known for its historic Old Town and colorful riverside warehouses. The town is also notable for its local artists, including Finland’s national poet Johan Ludvig Runeberg whose home can still be visited today. It is also a popular destination for shopping, dining, river cruises, cycling, and pleasant scenic strolls along the river. For nature and outdoor activities, you can easily explore the nearby Pellinki archipelago from Porvoo. It is a perfect Helsinki day trip as it is located about an hour away and is a town that is easy to explore on foot. We’ll share tips on how you can also visit Porvoo on a day trip from Helsinki as well as some of our favorite things to do in this historical Finnish town! 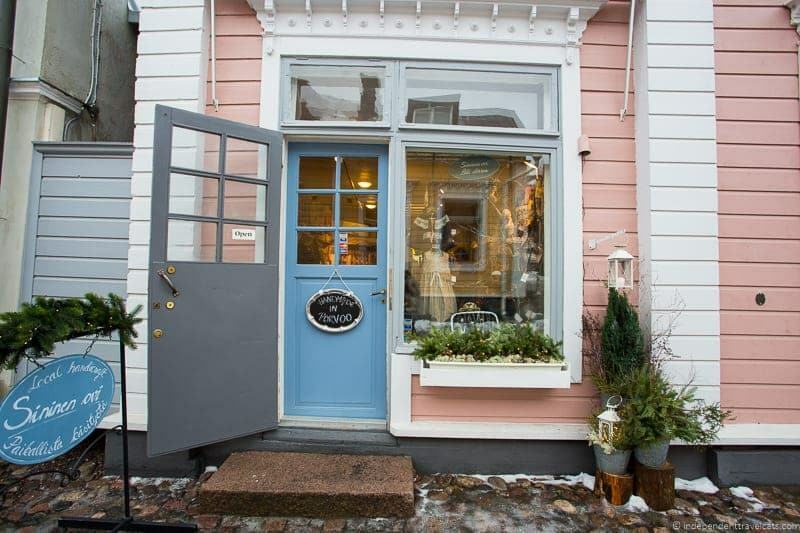 Find More Information on Visiting Porvoo? First we’ll go over all the information you need to get to Porvoo and how to get around once you are there. There are several ways to get to Porvoo from Helsinki or wherever you may be in Finland. The easiest for most visitors is to take the local bus or take a guided day tour. But you can also get here in a number of other ways, although some are seasonal and weather-dependent. The bus is probably the most convenient way to get around. It takes about 1 hour to 1 hour and 15 minutes to get to Porvoo from Helsinki and costs around €10 – €18 for a round trip ticket. The bus network is quite good and reliable in Finland from our experience. You can check bus timetables and schedules online, and if you are going to be taking a lot of bus rides in Finland you might want to check out the Finland Bus Pass. If you have a car, you can drive here in about 45 to 50 minutes from central Helsinki using the main highways. However, if you are looking for scenery or want to follow a historic route, you might consider driving a portion of the so-called Kuninkaantie (Old King’s Road) or Great Mail Route which is a route used in medieval times for the king’s messengers and the postal service which extends all the way to Russia. 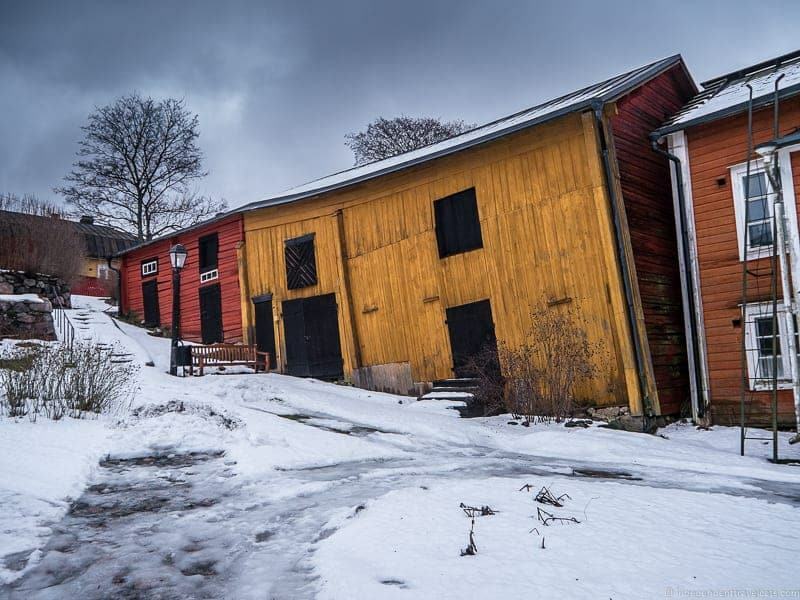 Driving is pretty convenient (although check road conditions during winter) and there is parking available in Porvoo, including free, time-limited, and metered. Note that some lots require you to use a parking disc. See parking areas and regulations for Porvoo if you are planning to drive and park here. Free parking areas are available for motorcyclists. You can also book a guided bus day trip from Helsinki to Porvoo if you don’t want to organize transport on your own. It also means that you will have a guide to help give you background on the town and show you the main highlights. This 4.5 our guided tour from Helsinki by coach includes guided tour of Porvoo and 1 hour of free time. This 4 hour small group tour includes local guide and transport to and from Helsinki by mini-van. Option for hotel pick-up. This well-rated 5 hour guided option includes a guide who will accompany you to Porvoo and back by public bus. Guide can meet you at hotel; us tickets are not included in tour price but guide can help you purchase. If you have a Helsinki Card, which is a discount card for a number of attractions and museums in Helsinki, it currently includes a discount on a guided Porvoo half day sightseeing trip. You can see our Helsinki Card review for more information about this Helsinki pass. If you happen to be visiting in summer, you also have the option to take a slower but more scenic river route. Both the m/s J.L. Runeberg and the Royal Line’s m/s RoyalCat offer almost daily cruises between Helsinki and Porvoo between May and September. For those who want some exercise and scenery, consider cycling along the King’s Road route to get from Helsinki to Porvoo. It is about 39 miles or 62 kilometers each way. You can keep cycling all the way to Russia on this historical route if you have a week! There is a train station in Porvoo but it does not currently have regularly scheduled service although train trips using classic trains are often arranged in the summer for tourists; you can check the current schedule provided by the Porvoo Railway Museum. If you decide to stay overnight (recommended if you really want to explore the town or spend time in the archipelago), there are a lot of Porvoo lodging options available. You can also check on Airbnb options if you prefer a room or apartment. For more Finland travel information, we also recommend checking our our other articles on Finland including our guide to visiting Finland in winter, things to do in Helsinki, things to do in Oulu, summer activities in Finland, husky sledding from Rovaniemi, and our Finland winter packing list. For guidebooks, we recommend the latest edition of this Lonely Planet Finland guidebook. The first thing to do is to decide how you are getting to Porvoo and how much time you plan to have in the town. Your time may be limited by a bus or boat schedule, or if you are driving yourself you can linger as long as you wish. 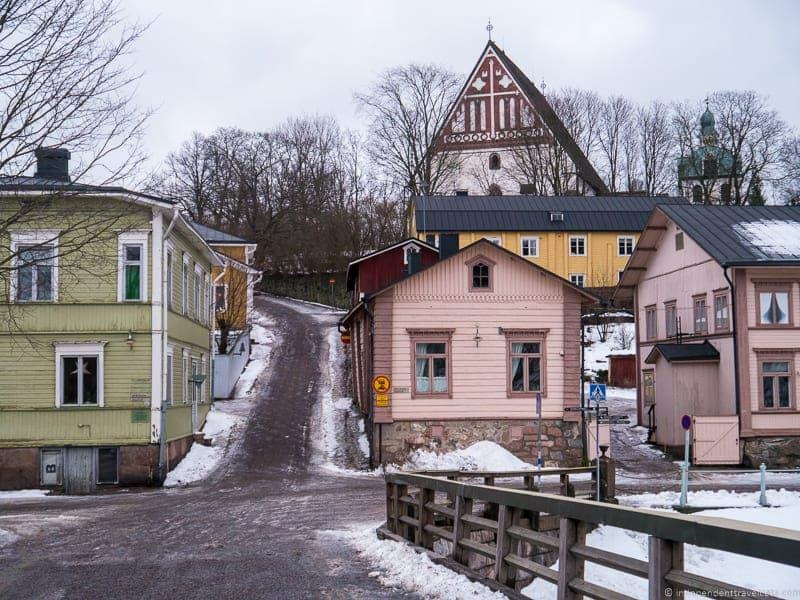 Porvoo is considered one of the most picturesque small towns in Finland and a stroll through its historic Old Town is the one must-do on a day trip here. 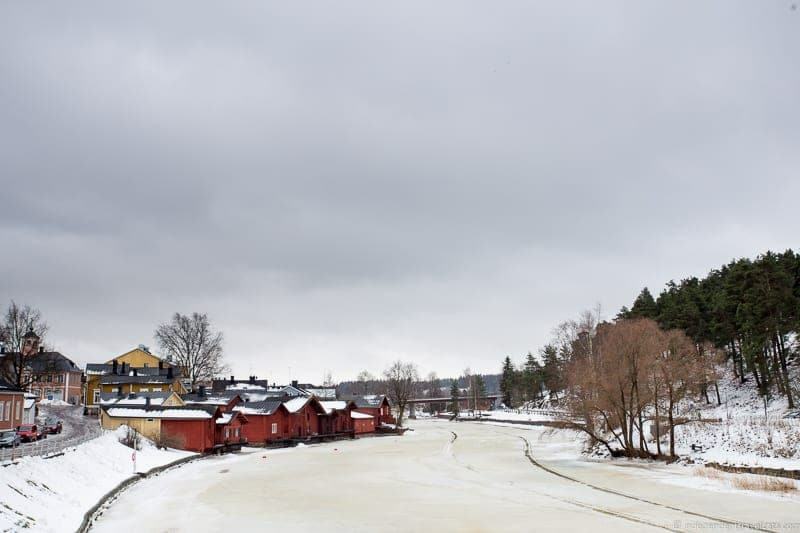 We visited in January on a cloudy winter day, but even so you can see that Porvoo is still quite pretty. We can only imagine what it would like on a clear sunny day! Porvoo is quite compact, especially the Old Town area, so this is easy to do on your own as a self-guided tour. You can pick up a free map and some brochures from the Porvoo City Tourist Office or print or download them on their website. You can also do a guided walking tour of Porvoo as we did to learn more about the history of the Old Town sites before exploring on your own. Guided group tours depart each afternoon in the summer, but otherwise private tours and non-summer tours can be booked in advance of your trip (contact the tourist office for more information). 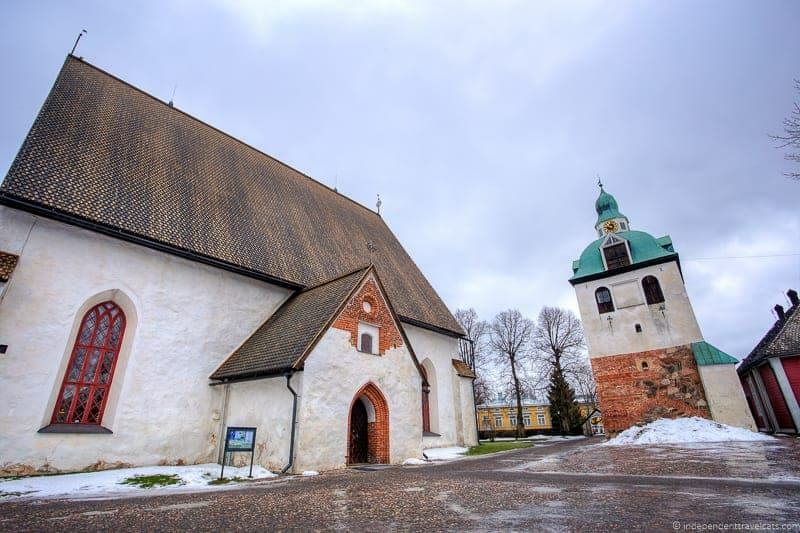 The Porvoo Cathedral is an Evangelical Lutheran Church built in the 15th century, with some parts dating back to the 13th century making it one of the oldest churches in Finland. There has been a church on this site since the 11th century. This church serves as the seat of the Diocese of Borgå, Finland’s Swedish-speaking diocese. It was here that the Diet of Porvoo was signed in 1809, which was when Finland became a Grand Principality of Russia, rather than being ruled by Sweden. This was a key event on the road to Finnish independence, which finally happened in 1917. There have been a number of events that have threatened or damaged the church over the year, with the most recent disaster being a case of arson in 2006, when the entire roof was burned and destroyed. The church is still active and it is free to visit when open. The Old Town Hall, in the heart of the old town, is a colorful two-story building with a mansard roof and a wooden clock tower. Finished in 1764, the building housed Porvoo’s administrative court, the council, and the constabulary. In 1809, the Diet of Porvoo mentioned earlier was convened here. The building continued to serve as the Town Hall until the end of the 19th century, and then was turned into a museum which saved the building (which has some structural issues) from being demolished. 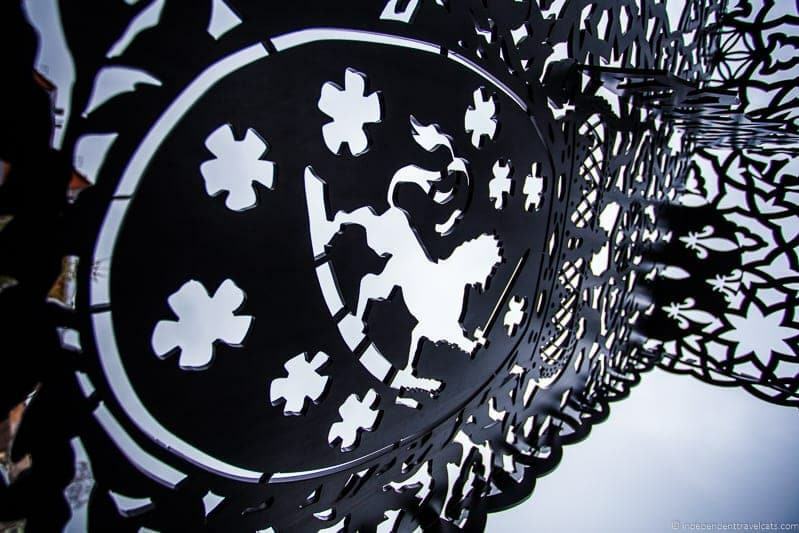 Today you can can still visit the Old Town Hall museum, which houses local history and art exhibitions. Probably the most photographed landmark in Porvoo, these riverside red wooden buildings once served as storage areas for the river trade. They served as warehouses to protect fruits, wines, coffee, tobacco, wood, spices, and other goods shipped along the river. 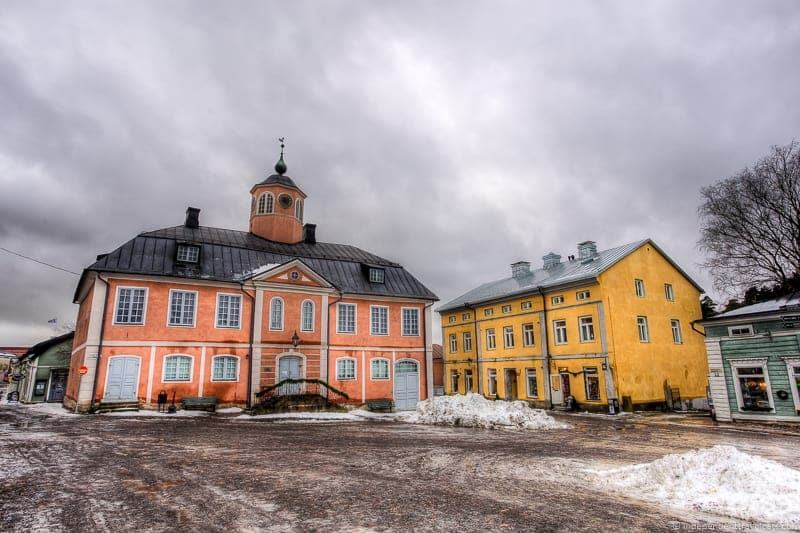 These shore houses were painted with red ochre in the late 18th century in honor of a visit by Swedish King Gustav III to make them look more beautiful. They are still very pretty to look at, with the best views from the road-bridge across the Porvoo River or from the park on the opposite bank. Today, most of the these former river warehouses are used as private homes, storage places, or restaurants. As you are walking around the Old Town, you are bound to notice a lot of little shops in the historical buildings. 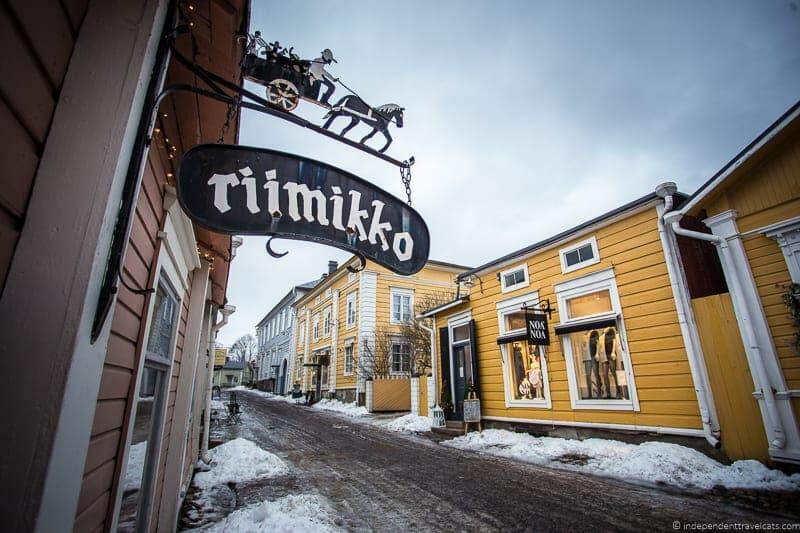 Many of the boutiques and shops are located on Jokikatu and Välikatu Streets and around the church, but you’ll also find them tucked here and there in the Old Town. The Art Factory building on the west side of the river also contains a few shops as well. Laurence and I have to keep our shopping to a minimum given our travel lifestyle, but we took a bit of time to nose around some shops and do some window shopping. As we were wandering around, we spotted small boutiques, antique stores, craft stores, second-hand stores, and souvenir shops offering everything from postcards to Christmas decorations to antiques. I’d recommend just popping into shops as you see them! 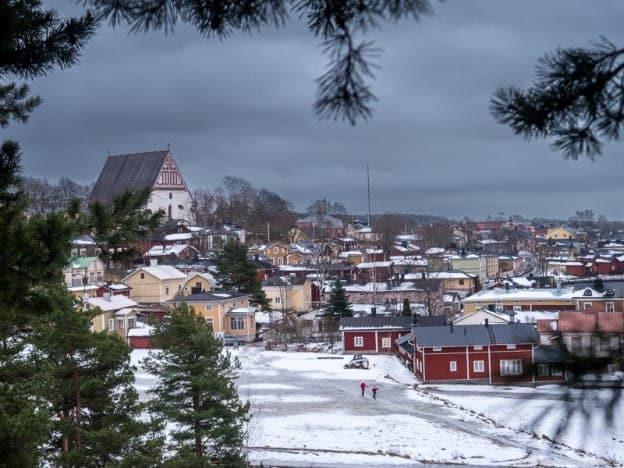 Porvoo is a great place to try some Nordic cooking with many places specializing in Finnish cuisine, although you can also find Nepalese, American, Italian, pub fare, and more in Porvoo. 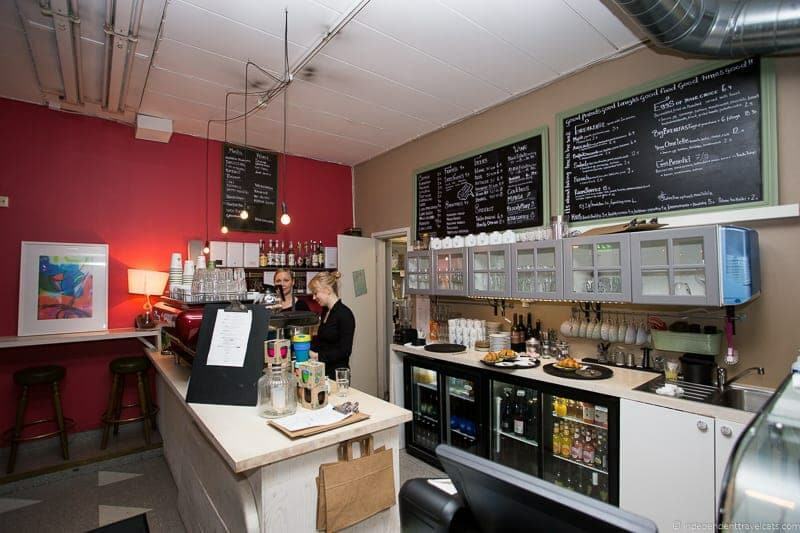 You can check out this list of places to eat and drink in Porvoo. As daytrippers, we stopped in for a coffee at the stylish and cozy Cafe Rongo recommended by our guide to get us started, and then later we stopped for a great Finnish homestyle lunch at centrally-located Ruokapaikka Hanna-Maria which serves food cafeteria-style during lunch with budget-oriented meal options ranging from 7 to 10 euros. We had a very tasty and typical meal of reindeer meatballs, mashed potatoes, and lingonberries. This hearty meal with coffee was great on a winter day to get us warmed up and ready for some more exploring. If you like sweets, I would also recommend you try the local specialty called Runeberg’s cake. These were first made by a Porvoo baker who made them after a cake that the poet J.L. Runeberg is said to have eaten for breakfast. You can find them today at many of Porvoo cafés and eateries. You may also want to try some chocolates while in Porvoo from local chocolate and confectionery maker Brunberg which has been around since 1871. You can see the sweets being made at the Brunberg chocolate factory which is a 30-minute walk from the center of Old Town or you can just stop at their shop located in the Old Town. Unfortunately, most of these museums were closed during our visit as most museums are open seasonally or have reduced hours in the autumn and winter months. For history lovers, you might want to check out the Porvoo Museum which includes both the Holm House and the Old Town Hall, where you’ll find exhibits on art, history, and objects and furniture from the 18th century in two historical buildings (entrance tickets are good for entrance into both buildings). If you like dolls and toys or are traveling with children who do, then you should consider a visit to the Doll and Toy Museum, which has over 1,000 dolls and hundreds of toys on display, some over which are over two hundred years old. Perhaps the best known attraction in Porvoo is the former yellow painted home of national Finnish poet Johan Ludvig Runeberg, his home is now a the J. L. Runeberg home museum (has been since 1882 making it the oldest home museum in Finland!). You can also visit the sculpture garden nearby of his eldest son, Walter Runeberg (entry is included to both sites when you buy an entrance ticket). Another local artist was Albert Edelfelt (1854-1905) whose studio can be visited which includes exhibits of his drawings, photographs, and paintings. A car, bike, or taxi is needed to visit the Albert Edelfelt Studio Museum from the center of Porvoo as it is 4.2 miles (or 7 km) from the town center. Also don’t miss the The Art Factory which is highlighted below. The Old Town is the highlight for most visitors, but if you want to see a more modern side of Porvoo you can cross the river to see modern apartment buildings and businesses on the west bank. Most of the local people are not all living and working in wooden medieval buildings! Perhaps the most interesting place for both visitors and locals is The Art Factory located on the west bank of the river by the Aleksanterinkatu Bridge. The Art Factory has a long history of serving as a building for a number of industrial uses, including making plywood and horse shoes, until it was later converted to rented artist studio and finally into a cultural center. It opened in spring 2012, and now houses art exhibitions, a concert venue, cinema, boutiques, and Bistro Sinne which serves local food. You’ll also find the Porvoo City Tourist Office located here. This is quite an exciting place for the local people who now have more access to cultural exhibitions and events. We visited a free contemporary art exhibition here and while we had already eaten, the bistro had a very appealing menu! We were surprised to learn during our visit that everything from skiing to kayaking is possible in Porvoo, depending on the season of course. Hiking and cycling are very popular year round with a number of maps of well-marked routes are available online or via the Porvoo City Tourist Office. The National Urban Park begins in the Porvoo city center and is a great area to hike, bike, or get on the river. During the late Spring and Summer, boat rides, kayaking, canoeing, and stand-up paddleboarding are popular in the area. Check in town about bike, kayak, and paddleboard rentals, generally available in the summer months only. We visited in winter and we could see the ski slopes in the distance which overlook Porvoo. Both downhill and cross-country skiing, including ski lessons, are possible at the Kokonniemi Ski Centre. When the river is frozen, you may also see locals skating, skiing, ice fishing, and walking on the river; great winter activities but do be sure to check ice conditions before trying this yourself! For those with more time visiting in the warmer months, I’d advise a trip to the Pellinki Archipelago where you can engage in a number of outdoor and cultural activities. North of the Old Town of Porvoo, you’ll notice some hills that are important ancient archeological sites and great viewing points. The larger hill called Iso Linnamäki (Great Castle Hill) is the site of one of the largest ancient fortresses in Finland, while the smaller hill called Pikku Linnamäki (Lesser Castle Hill) is contains an Iron Age burial site. There are a number of paths you can take to get up here, crossing over wooden bridges and former moats. It is a nice short hike and a great place to get another view of the river and the Old Town of Porvoo. It was this view that would be depicted by local artist Albert Edelfelt in his painting Porvoo seen from Linnamäki. It is a great way to see a bit of the natural surroundings and we loved the view on the way up! There are of course other things to do in Porvoo Finland, but the above are our hand-picked highlights for a day trip from Helsinki or elsewhere. 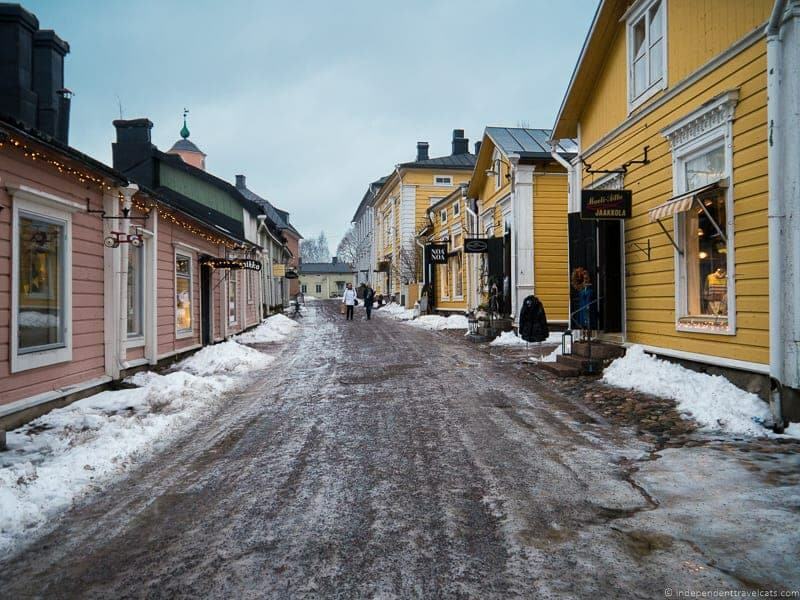 We were told by a guide that most visitors come to Porvoo only for a few hours or a day, but there is more to do in the area if you want to stay longer! If you are planning a trip to Finland, be sure to check out our other posts covering top winter activities in Finland, things to do in Helsinki, outdoor summer activities, exploring the UNESCO town of Rauma, and more! 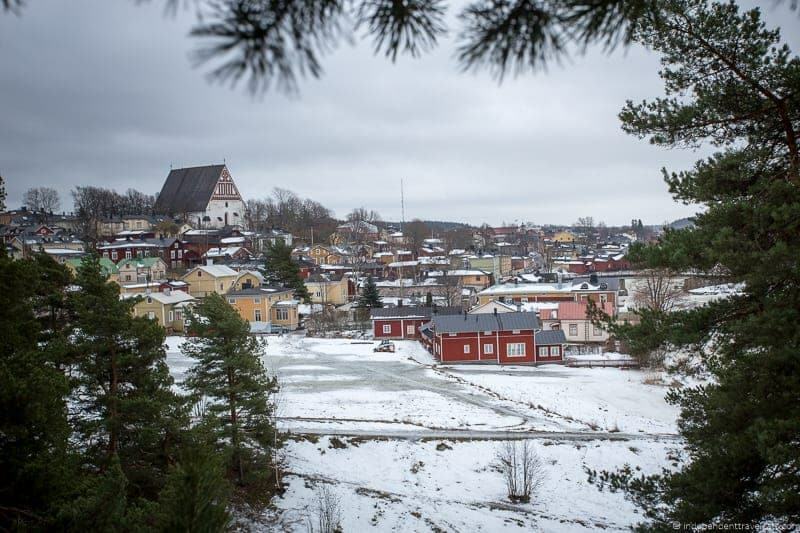 What would you do if you had a day in Porvoo Finland? If you have been to Porvoo, feel free to share any additional tips or share your own experiences. As always, feel free to ask us any questions about our trip to Porvoo or any other questions about our time in Finland. We did a similar day trip to Porvoo from Helsinki during summertime! Thank you so much for such great information on Porvoo. I have been failing about trying to find somewhere to go on a day trip from Helsinki and this was so very helpful. We r couple from India & on a tour to Finland. Now wanting to visit porvoo, by the help of your blog we r planning to do so. Well thanks for the details. Will get bk to u once bk. Oh wow! 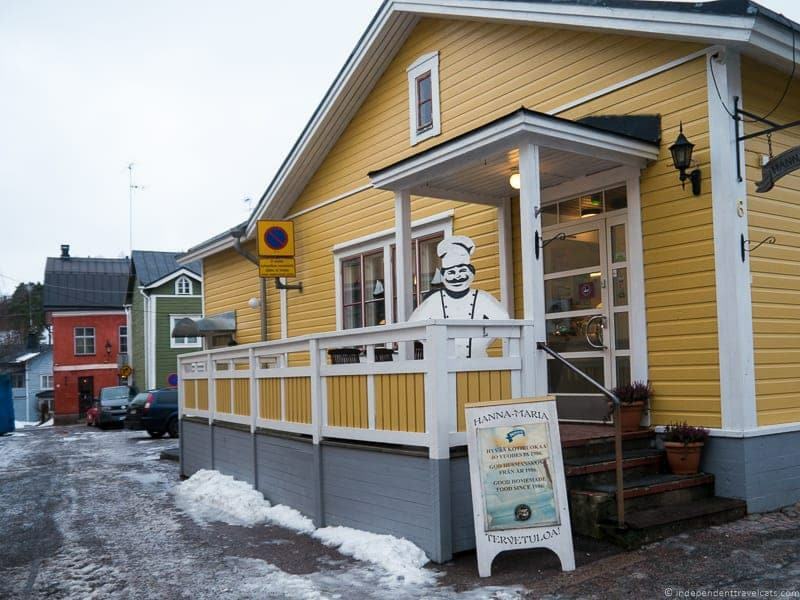 I need to get to Porvoo the next time I am in Finland. I might need to rethink a winter vacation here – your photos are gorgeous! Many of the links on this page are not working about Porvoo. Hi! I am visiting Helsinki in a couple weeks and this looks like it would definitely be a great day trip- do you have any idea if I should book bus tickets beforehand or will I probably be able to just buy them that day? I just don’t know how long I will want to stay there, and at the same time I don’t want to limit myself to only a few hours. Thanks! great! that’s exactly what i was hoping to hear haha. thanks! Yes, it’s easy to get a bus from Kamppi bus station in Helsinki to Porvoo. Several departures per day. Porvoo is fantastic and even more so, if you have a local guide to tell you about it and show you all the highlights. Please contact me on Facebook, if you’d like me to arrange a private day trip from Helsinki. See you in Finland! 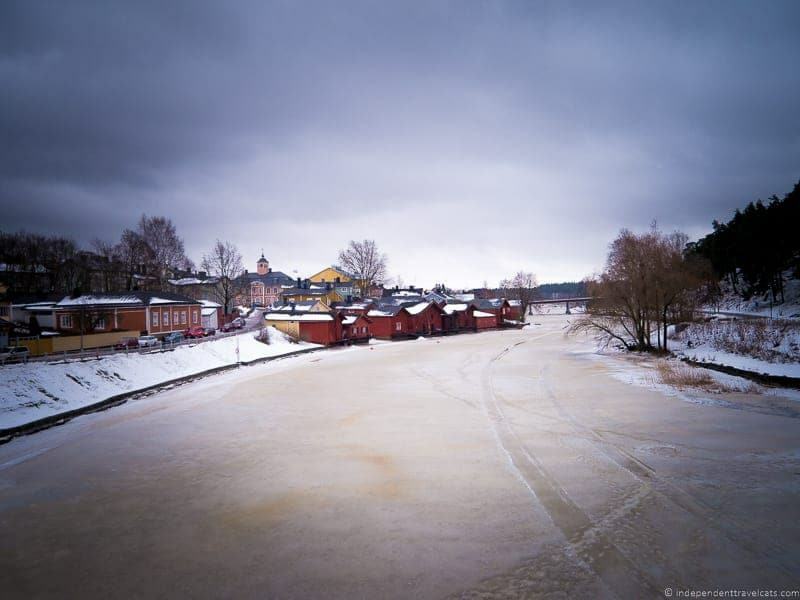 Hi Maarit, Thanks for sharing that you provided guided tours of Porvoo Finland. Anyone interested can click on Maarit’s FB link. What a great name! I might have to go to Porvoo just so I can say I’ve been…love it! I love to do day trips using a big city as a base. This place looks gorgeous. Makes me want to visit Finland and explore its beautiful cities and towns. I didn’t know much about Finland before I went, but there are many pretty and historical towns to explore – great country if you love winter activities! Yes, Porvoo makes for a great day trip from Helsinki. Easy bus connections or a relatively short drive!